EPF members who are trying to login at UAN member portal or who want to download their PF passbook need to enter their UAN number and password. Every EPF member needs to verify their UAN number at the UAN portal, during the verification process they need to set a password for UAN portal. Here you can find some valid EPF UAN password examples, which will help you in creating a strong password for your UAN number. It must contain at least 1 capital letter and 1 small letter. The maximum length of the UAN password should be 20 characters. Here we have listed some UAN password examples, which will help you in creating your UAN portal password. 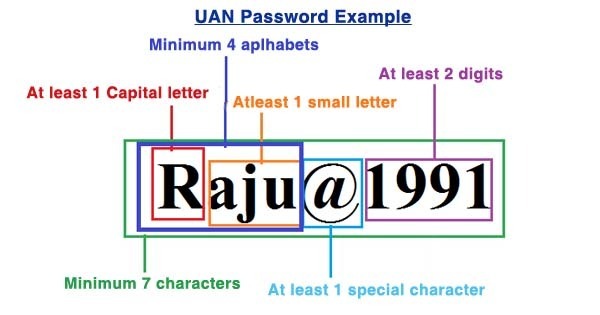 UAN password length should be at least 7 characters and the maximum is 20 characters. You cannot create a password of fewer than 7 characters or more than 20 characters at the UAN member portal.